Collins Booksellers - The End of Lean? by Chuck Munson, 9780133758405. Buy this book online. 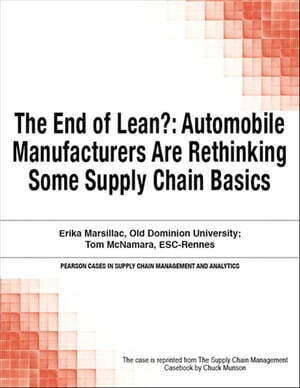 This case study shows how automobile manufacturers are reconsidering some "lean" approaches in the wake of events that have stretched supply chains beyond their limits. It focuses on two disasters: the devastating earthquake and tsunami that took place in Japan in March 2011 and an explosion in early 2012 at a key German chemical plant that produced a special type of resin used in fuel lines. Because many automotive companies had studiously eliminated redundant suppliers to reduce complexity and costs, suddenly there was no backup plan--risking potential model shortages and idle assembly lines. Focusing on realistic issues, this case study offers exceptional value to both students and practitioners. Authors: Erika Marsillac, Old Dominion University; Tom McNamara, ESC-Rennes.